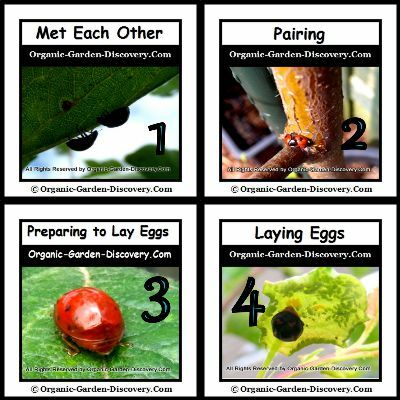 Organic garden pest control is simple; if you can recognize all the beneficial insects in your garden. In our garden, the most challenging insects pests are all kinds of Aphids. 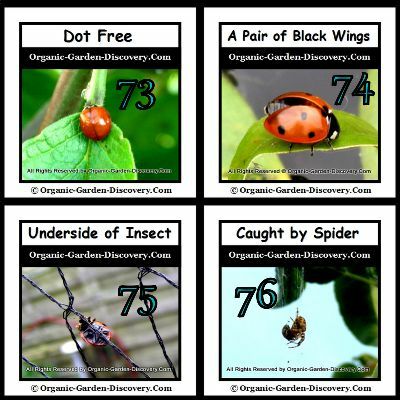 If you want to control them manually all by yourself; you may not be able to manage your task efficiently; even you are willing to stay 24 hours in your garden. 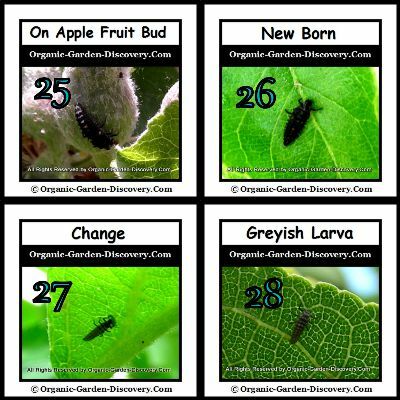 If you prefer to spend more of your time on planting, you can simply assign the task to your helpers; and act only on urgent basis. 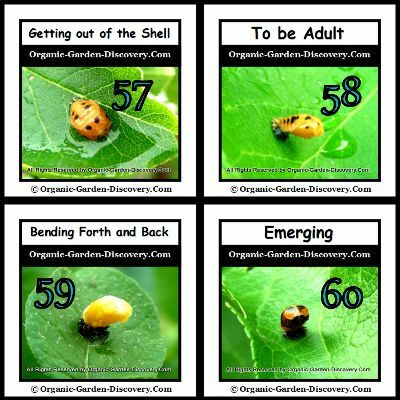 If you are a natural gardener who loves to hand-pick the pests from your plants and trees; you may need to first be familiar with your all time wanted essential insects appearance; from their baby stage to their adult form. In this way; you will not be destroying them by mistake. 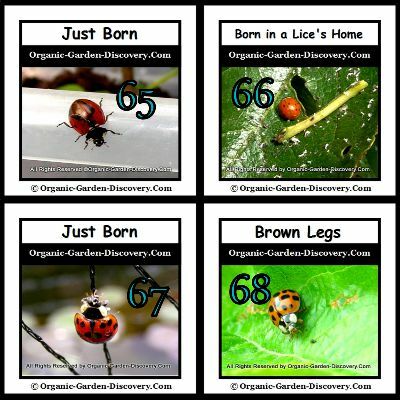 These loving adult Ladybirds will be started roaming on your plants; or trees during the frost free sunny late winter days; early Spring and in the early summer. And soon they find a partner (picture 1 above). 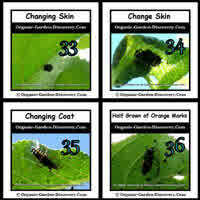 When the mid-day temperature reaches 20°C; especially under the mild sun or in the shadow; they pair (picture 2). 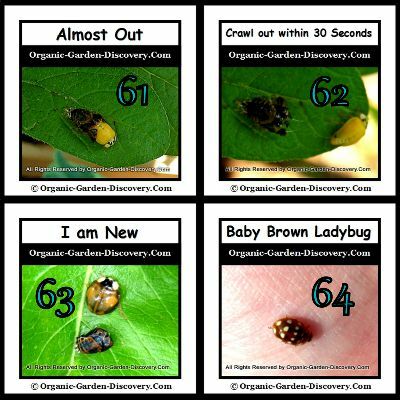 The more pests on your trees; the more beneficial insects will be there to help. There are plenty of adult bugs on our fruit trees; so I can see the rice a-like eggs are laid everywhere; in just a couples of days. *The females, after pairing, she will get ready to lay eggs (picture 3&4 above). 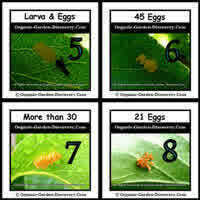 *The eggs numbers are range from 2 to 50 (picture 5 to 10). *The eggs are laid in patches on underside of the leaves most of the time. 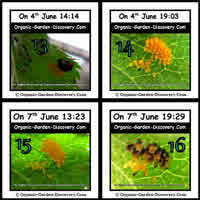 *The eggs may laid on the surface of the leaves; only when the leaves have no direct contact to the sunlight. *The colours of the eggs may defer. 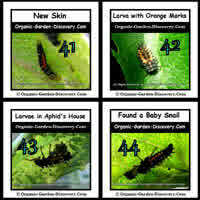 Range are from cream (fresh) to deep orange (ripe). 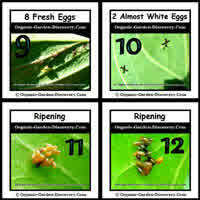 *If the eggs are exposed openly to the sunlight; they will be faded to white (picture 10). The beetle first laid a larger egg; afterwards this egg cracked and burst into many mini eggs. See the image 81 to 83 (slid 21-23) above. 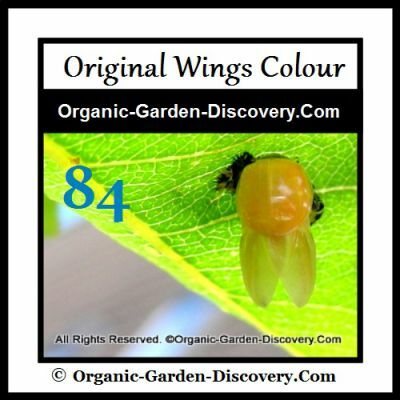 Wings (image 84) from the new born beetle is in pure orange (slid 24) before it change to black. 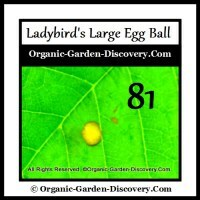 *First, the orange black to dark brown gel a-like thing is shown; when the egg is ripped (above picture 11&12). 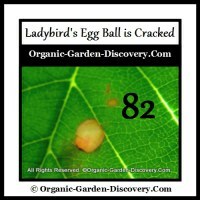 *A layer of semi-transparent skin is appeared outside of the hatched eggs (picture 13-16); in about 3 days. 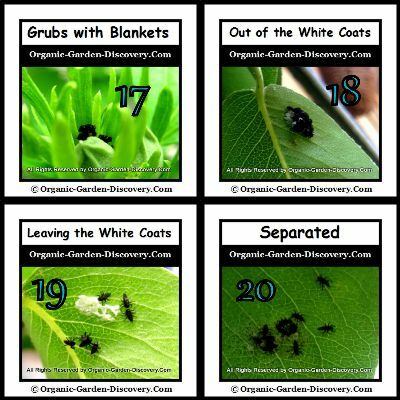 *Thereafter, the mini, flat, black, and funny looking 6 legs Grubs (Larvae) will be rolling out from the eggs in a few hours time; and they left their white blankets behind (picture 17-20). 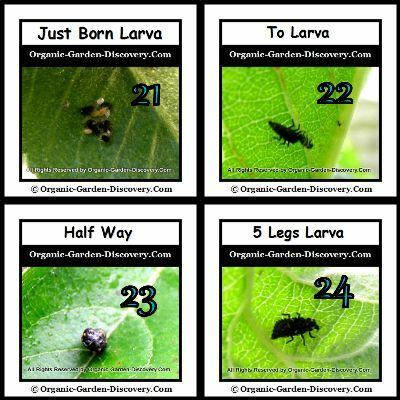 However; under some special occasions; the grub may born with unusual numbers of legs (picture 24&26). 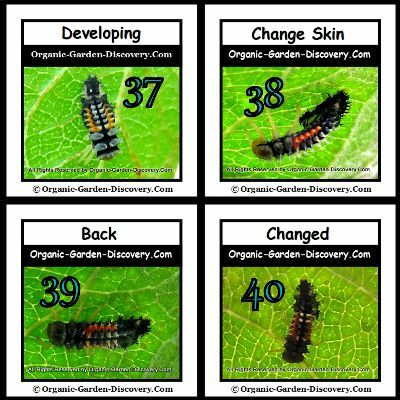 Most of the larvae are in total black; the rest are in light and dark grey (picture 27&28); or with orange highlights (picture 29-32). 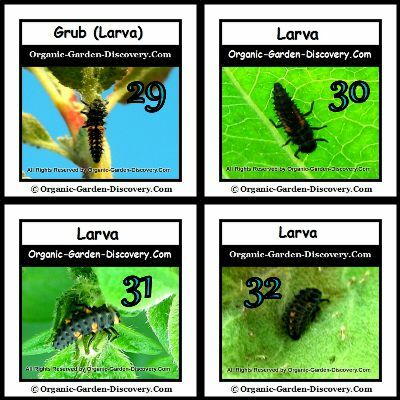 You can see many different faces of grubs (picture 21-24) are born everyday. 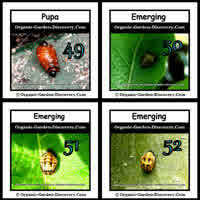 *Later; they will become larger and are very active. 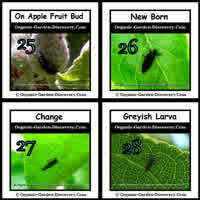 *These gentle insect's larvae grow very fast, and change their skin many times within the same season. 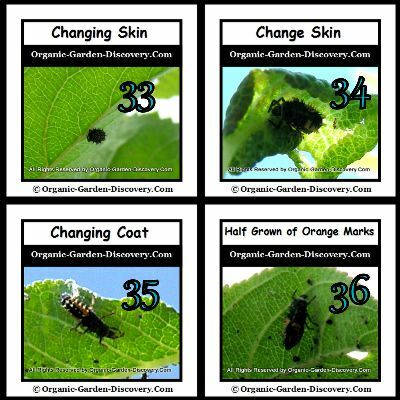 You can see the skin of some creatures on their back body will develop from total black to little orange and white marking (above image 33-36). When they change skin, the legs are gone together with the old skin (picture 77&78). I find the development of their body (musical instruments a-like) is most interesting (picture 37&42). In the changing skin progress; some of the grubs may change the colour of its head from transparent cream to charcoal black (picture 38-40). However; some may remain as cream colour (picture 41); when it is done. 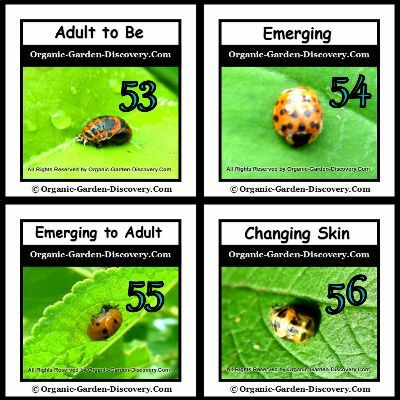 No matter what shapes and sizes they are; as soon as they have changed the skin; they will start to feed themselves on supper speed. Besides Aphids or green flies (above picture 43); they eat also Lice (picture 66); and baby snails (picture 44). 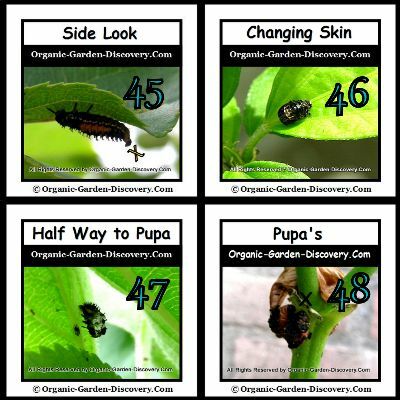 After several days of work; they will hide on one of the cruel-up leaf; or simply find a safe place; and turn into the state of pupa's in less than 24 hours (above picture 45-49); and they start their magic change again. During the emerging to Lady Bugs progress (picture 50-58); the pupa's will bend their heads forth and back (picture 59&60) to loosen their skin. 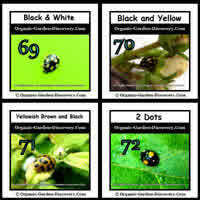 The newly born insects can be dot free or 2 dots (picture 61, 62&73); and in several types of mixture of colours in their bodies (picture 63&64); black or brown legs (picture 65&68); and in different shapes of heads. The perfect organic garden pest control insect is a little round, red beetles with black spots; orange or yellow with black spots; or black with red spots (image 69-72). The underside is flat (picture 75). 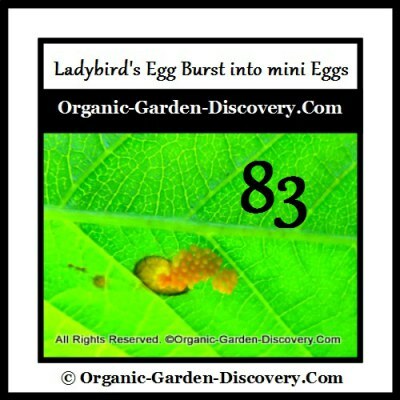 Ladybirds have little black wings hide under their bodies (picture 74). 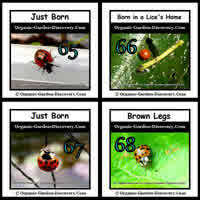 The adult insects can fly very high with high speed; once they detected vibrations from anyone near. 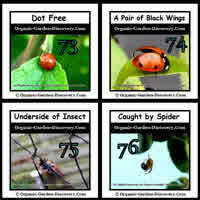 All insects in the nature must be aware of the most powerful spider web (below picture 76). 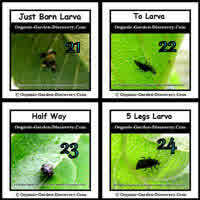 Once they are being caught; you cannot do much; but to leave them alone. 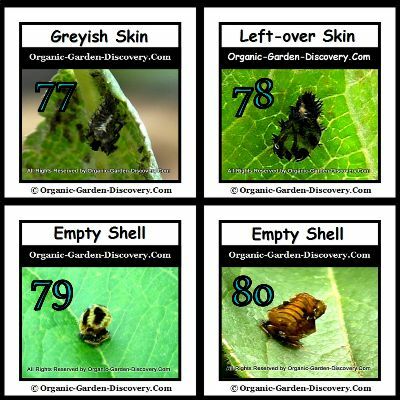 Once the insects are born; the old empty shells (above picture 79&80) will be left on the leaves. And they will be burnt off when the sun arrives. The females will again pair and lay eggs; and the life-cycle begins again; once they are matured. Organic garden pest control by using high volume of friendly insects is cost-less. And it is the best; and the most effective way.